Where do I begin? I have been SO busy getting our new house ready so we can move in. We closed on the house a little over a week ago. I woke up that morning and had some NASTY stomach bug...Yes, I was puking! UUrrrrgggggg I managed to make it to closing without having to run to the bathroom. Life was grand. Ever since we closed all we have done was clean, paint, repair, and do everything a house needs before moving in. I am flat worn out!!!! I have spent the past 10 days at a workshop @ MTSU for Science...it was fun, but once again I am worn out. I made a lot of money, learned a little, and made a few new friends. You can never have too many teacher friends. I am glad it's over with and I can stay at home. This week I am going to pack and finish up all the last minute details on our new house. We have to be out of here by next Saturday...pushing it close. We still DON'T have the carpet in, nor is the hardwood in. I am getting a little stressed & I am starting to get in panic mode. I am sure everything will work out. I will post some pics from house later in the weekend. Owen seems to be doing great, but I noticed his ears are FUNKY!!!! I am worried he has yet ANOTHER ear infection. I called the doctor today and they want to see him in the morning. For the past three nights he has woken up NUMEROUS times and I don't know how many more nights I can handle like that. He is getting really big. For the past two weeks he has been walking and now he is pretty much a pro. He has also mastered climbing up the stairs. Today he climbed up ALL the stairs. It scares me so bad & I see a baby gate in our future. I can't wait for Owen to see his new house and his new bedroom. We painted it blue. 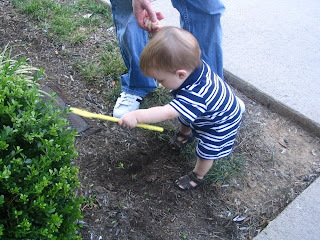 Being outside is something we all enjoy and Owen played in the mulch for the first time this week. He didn't want to go inside and literally threw the biggest hissy fit. Once again...Owen won. 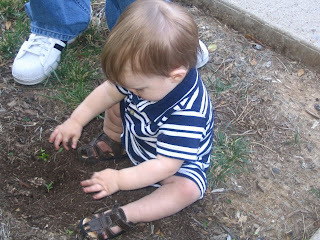 :) I can't wait till we move and we can go out in our little backyard and he can play. 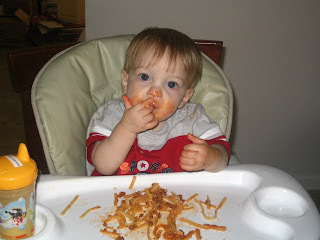 The other night for dinner we had spaghetti and Owen had such a blast eating it. When he was finished it looked like he had war paint all over his face. I like feeding him, but on this occasion I let him dig in. 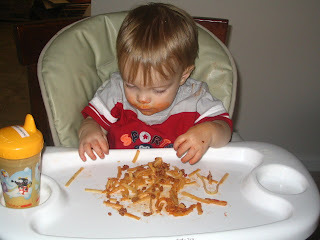 It is really hard serving pasta on a spoon...his little fingers came in handy. So, here I sit on the 4th of July, alone, Owen is asleep, and Tony is in the bed sick AGAIN!!!! I thought we would watch the fire works on TV, but that was quickly shot down. I am SO sick of the illness that surrounds this family. I pray everyday that Owen can stay healthy b/c it is so pitiful seeing a sick baby. Well, I am going to catch up on shows on the DVR & relax! I am taking Owen to the doctor in the morning and then who knows what else I am planning on doing. We were supposed to go to my sister in-laws house tomorrow for a cookout, but that's a little up in the air right now.